To the people who visit it, your website is your company. If you want an identity that sets you apart from competitors, the design is critical. So before we design the site, we study your business. We’ll ask a lot of questions. Two of the most important are: “What do you want to do on the web that you can’t do now?” and “Where does it hurt?” What are the problems and frustrations you struggle w1ith? Your website should help relieve the pain. Only after we’ve studied your business will we start on the design. And design is much more than just what your website looks like. It includes: What information will be given high and low priorities; What goes where; How users will move from place to place on the site to do what they want to do. The design of the homepage gets special attention. It’s the first impression so it must win credibility and get the visitor to stay. Its design can also lead Google to give you a higher ranking. We’ll show you at least two complete designs for discussion before working on a final. Many common website features—things like site search, staff directory and FAQ’s—can be done with existing software components. People call them apps, widgets, modules or plug-ins. 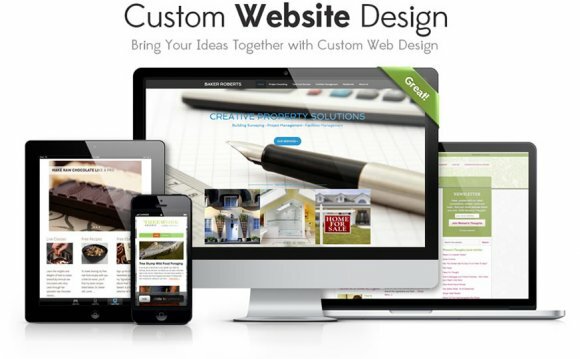 We’ll get the ones that best suit your needs and customize them to blend seamlessly with the rest of your site. They’re inexpensive, reliable and user-friendly. Not every site can be built with existing components though. You might need your own special way to search for products or make payments or fill out multi-step forms. We have programmers who specialize in that kind of thing, and their experience of writing hundreds of these apps will help hold down the cost of yours. We can make your website automatically adjust to look just as good and work just as well on phones and tablets as on computers. It’s called “responsive” design. You won’t need to have different websites for different devices. You won’t have to try to get people to read a site that’s been squeezed down. No matter what device your customer uses to look at your website, they’ll be able to do the same things and have the same positive experience of your company. More searches are now done on smart phones than on computers, and Google now gives mobile-friendly sites a higher ranking in search results. We can make it easy for you to thrive in this mobile-web world.